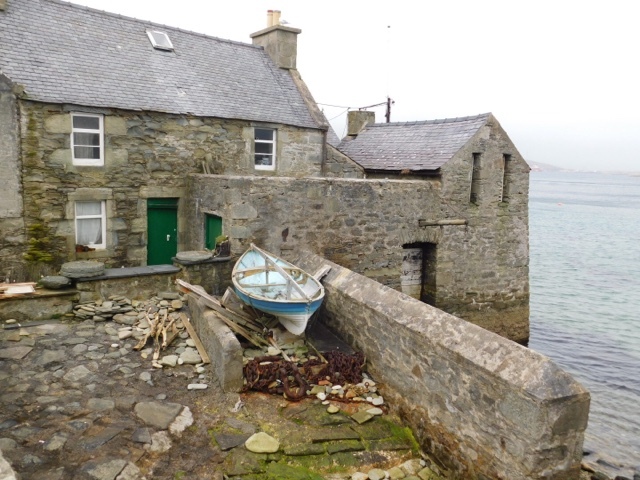 A four day break in Shetland, Scotland's most northerly Island archipelago. Sailing from Aberdeen to Lerwick with Northlink Ferries. Day 1 - Bagpipes, settling into our accommodation and finding our feet in Lerwick. We've not long returned from a fantastic 5 night/4 day trip to Shetland. I'd actually visited once before but couldn't quite remember when. Foodie Loon recalled that the film showing in the cinema on the ferry had been Erin Brockovich which places our visit in 2000. A whole 17 years ago. Pretty much all I remember of the trip was the rough crossing and the inside of a variety of bars in Lerwick. In my defence the reason behind our visit had been to catch up with a friend from Uni. Fast forward to an offer from Northlink Ferries for us to explore the Island as a family on a mini break in the Easter holidays. Suffice to say I jumped at the opportunity. 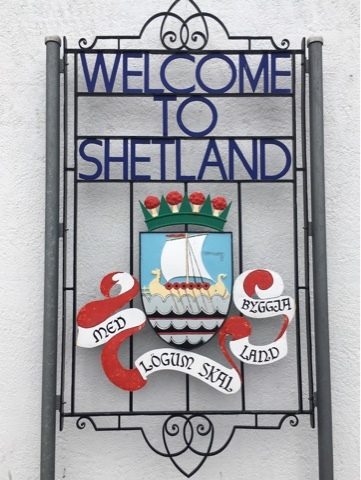 First port of call when it came to planning our Shetland Adventure was my friend Elizabeth - the UK's most Northerly food blogger - who lives in Shetland and blogs at Elizabeth's Kitchen Diary. I asked if she could perhaps suggest a plan for our 4 days on the Island, I had a wee bit of an idea of what I wanted to do but didn't really know enough about what was where to come up with a coherent schedule. 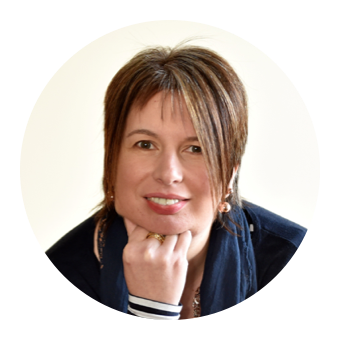 Elizabeth totally excelled herself with a comprehensive 4 day itinerary encompassing everything we wanted to do and more, plus a host of foodie recommendations along the way. She's a girl after my own heart! But first we had to get there and that meant the overnight ferry from Aberdeen to Lerwick. The MV Hrossey (the Old Norse name for Orkney) set sail at 19.00 and we boarded with our car around 17:30. The whole check in process was quick and easy. We were given our boarding cards which also acted as room keys for our inside 4 berth cabin. After driving onto the car deck we took our ourselves and our overnight bag up to the passenger deck and went to check out our accommodation. 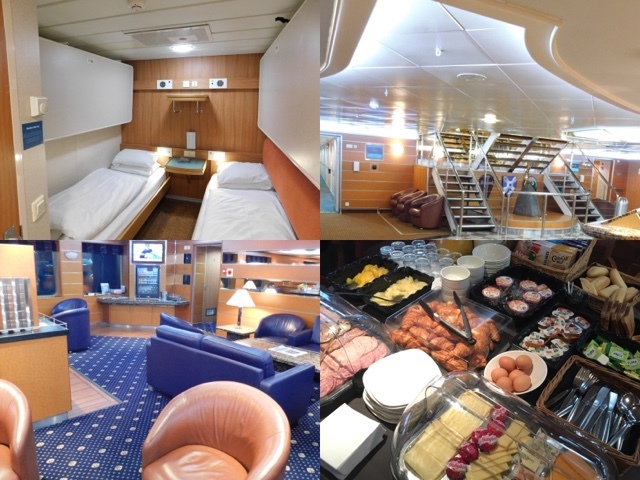 Our cabin was modern, clean and well equipped with en-suite toilet and shower facilities and a tea/coffee station. There were 2 lower fixed berths and two pull down bunks accessed by a ladder, thankfully the kids quickly claimed the top bunks! In addition to cabins there are also lower cost options such as reclining seats, sleeper pods and a cabin share scheme. Part of our ticket included access to the Magnus Lounge. All of us were really impressed with this facility and when we weren't asleep in our cabin we spent the majority of our time here. Entry to the lounge includes complimentary tea, coffee, soft drinks, snacks and two vouchers per person for alcoholic drinks. 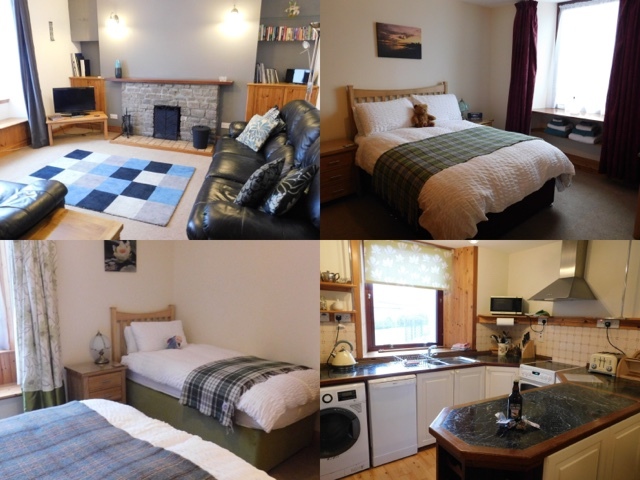 There are newspapers and magazines, board games, plenty of sockets to charge electricals, exclusive use toilets, the option of table service for dinner and a complimentary continental breakfast on arrival into Aberdeen or Lerwick. Personally I wouldn't hesitate to book this facility on any subsequent crossings. Whilst I enjoyed a Shetland Reel Gin & Tonic and Foodie Loon quaffed a pint of Valhalla Beer a plan was hatched. 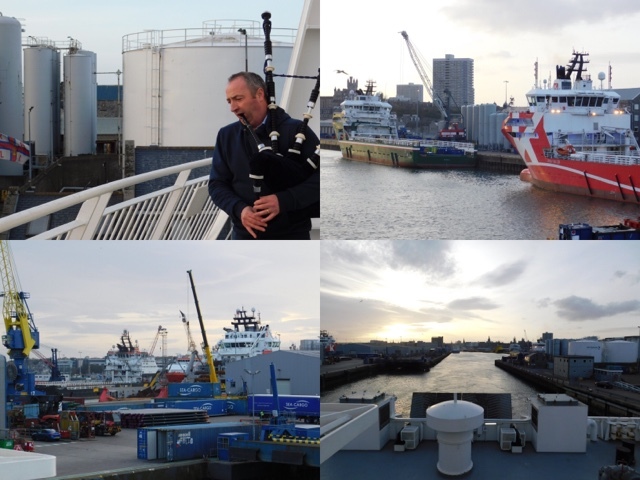 I've mentioned before that I have two Pipers and one Drummer in the family, one of which is due to be piping in Singapore at the end of the month for a boat launch (an Oil Industry Floating Production Storage and Offloading vessel not a Ferry!). Because of this he'd brought along his bagpipes to practise on holiday. Much to my daughter's horror and disgust he asked at reception if could pipe the ferry out of Aberdeen Harbour. The captain was duly contacted and agreed with the proviso that he didn't go on the upper deck as off duty staff were sleeping in adjacent cabins. There's no access to car decks during sailings and the doors had already been locked but he was allowed back to the car to retrieve his pipes. By this point Foodie Girl had completely disowned her Dad and couldn't actually believe that he was going to go ahead with it! He managed to cause a bit of a stir both on the ferry and on social media - as is my want I was Tweeting, Instagram Story-ing and Facebook Live-ing throughout. After all the excitement for some - and mortification for others - it was time for dinner. I was really impressed with the menu and the inclusion of so many products and producers local to Orkney, Shetland and Aberdeen. 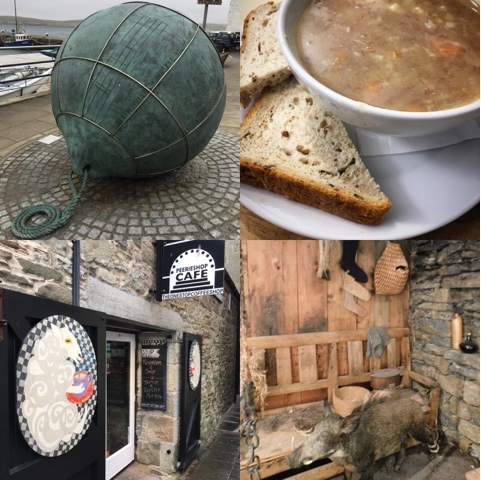 Between us we enjoyed Cream of Haggis Soup, Deep Fried Local Cheese with Island Chutney, Orkney Haggis Pakora followed by Orkney Pork & Leek Sausage Casserole and Orkney Beef Viking Burger. It would have been rude not to have left enough space for some Orkney Fudge Cheesecake for dessert! A good sleep was had by all and we headed to the Magnus Lounge for our Continental Breakfast before disembarking from the ferry at 07:30. 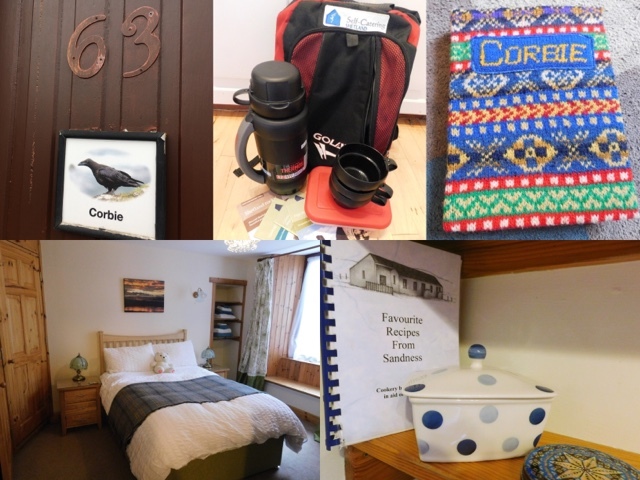 Our accommodation for 3 nights in Lerwick was provided by Self Catering Shetland who have nine fully furnished apartments available for let. Owner Steve was waiting for us at the terminal and we followed him to Corbie, a ground floor flat in the heart of the town. We quickly settled in following a rather heated argument about who got the single and who got the double bed. (Girl won with the flip of a coin!). Corbie is the Shetland dialect word for Raven and it really was a 'home from home'. There were lots of lovely Shetland heritage touches and the kitchen in particular was superbly kitted out. I reckon I could have cooked or baked pretty much anything had I wanted to! All the basics were provided such as tea, coffee, milk, salt & pepper, herbs & spices, washing up liquid, dish towels, kitchen roll, toilet roll, dishwasher tablets etc. Pretty much everything had been thought of - including wifi. One of my favourite touches, which I haven't come across anywhere else was a Walkers Backpack. This contained a couple of large Thermos flasks, tupperware sandwich boxes and a selection of leaflets and OS maps. Owners Gillian & Steve Henry were friendly and helpful and popped in on our first and last day to make sure all was well and answer any questions. Time to get out and about and explore a wee bit of Lerwick on our own before meeting up with Elizabeth for lunch. Lerwick is the capital of Shetland (it's only town) and is home to 7500 people. The old town centre consists of narrow streets and a network of steep lanes and staircases. Shops range from small specialist gift shops and cafes to larger traditional stores which appear to stock anything and everything. The majority are independently owned and (to the visitor) there is a refreshing lack of high street names. We spent a couple of hours browsing but I made the mistake of not actually purchasing any souvenirs thinking I could do this on our last day. Big mistake. Absolutely nothing is open on a Sunday. The Shetland Museum and Archives is outstanding and I couldn't believe that it was free to visit. It covers the history of the island geographically and socially. We explored the ground floor before lunch and returned to complete the upper floor on Sunday afternoon. Also worth a visit is the cafe nextdoor in Arts venue Mareel. Lunch was at The Peerie Shop Cafe and by the power of Twitter I'd asked earlier in the week if their famous Reestit Mutton and Tattie Soup might be on the menu and I was delighted to find that it was. With full bellies it was time for a tour led by Elizabeth. 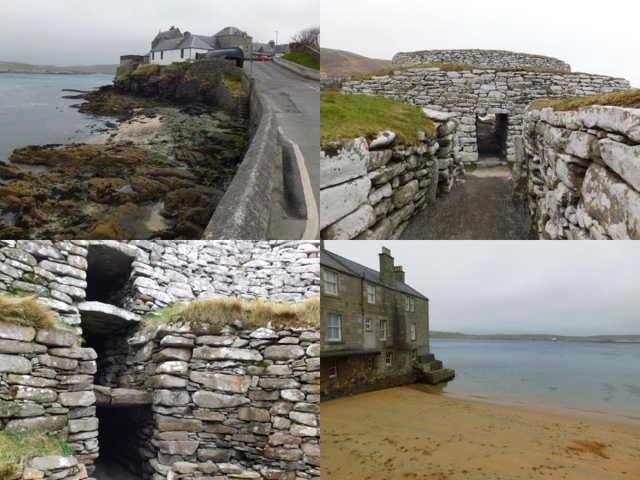 This took us through old Lerwick, around the Knab and the Sletts to the Clickimin Broch. Much excitement from me at the first of our stopping points the home of DI Jimmy Perez from the BBC TV drama Shetland. I'm now going to have to watch the first three series again to spot all of the locations. As a family we've recently been caught by the Geocashing bug so took the opportunity to bag some caches as part of our walking tour. Under Elizabeths expert eye we were rather successful with the exception of a frustrating DNF at The Knab. Our rather blustery coastal walk ended at the rather spectacular Clickimin Broch. Beaten by the wind we headed to Fjara Cafe Bar to warm up with Hot Chocolate, Coffee and Cake. The plan for the evening had been for the kids to go swimming at the Clickimin Leisure Centre and to return to Fjara for dinner. The swimming pool got a huge thumbs up from the teen and tween and they returned for a second visit later on in the week, but alas we clearly should have booked for dinner as there were no tables available for walk ins. Slightly disappointed we opted for a supermarket meal deal back at Corbie and an early night ready for more Shetland Adventures on Day 2 when we headed even further north to Yell and Unst. Day 3 took us to St Ninian's Beach and the South Mainland and Day 4 to Northmavine. Those will follow in a subsequent post but for now I'll fast forward to our journey homeward on the ferry. Much to Foodie Girl's relief it was raining heavily as we boarded the homeward ferry so Dad's bagpipes stayed firmly locked in the car boot. This time it was the MV Hjaltland (the Old Norse name for Shetland) which appeared to be pretty much identical in layout to the Hrossey so we had no problem in finding our way around particularly as we had exactly the same cabin number as for the outward leg of our trip. The Magnus Lounge was again at our disposal and we enjoyed Locally caught fillet of Haddock and Chips, Roast Shetland Lamb and an absolutely amazing tub of Lemon Curd Orkney Ice Cream. The children's meals onboard come in super cute Ferry meal boxes. 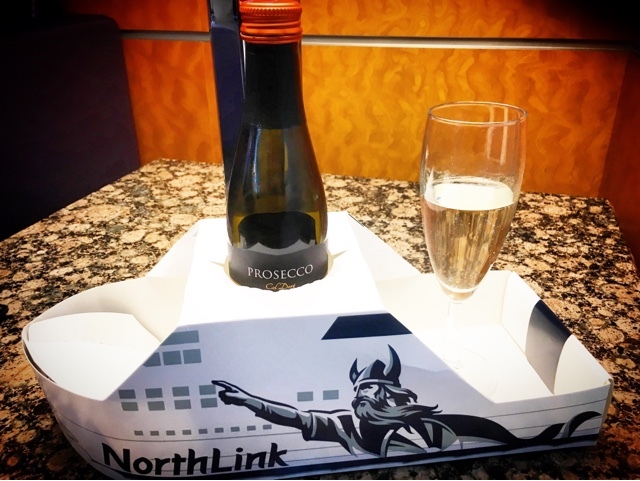 I may have misappropriated one for my own use #AllAboardTheProseccoBoat But with the amount of interaction it received on social media I reckon Northlink could easily sell grown up versions filled with drinks and nibbles. The crossing was rather rougher this time round and sickbags were required by one member of the party. For some reason the sailing from Lerwick to Aberdeen is half an hour quicker (perhaps because it's downhill?!) and we arrived into the harbour at 07:00. 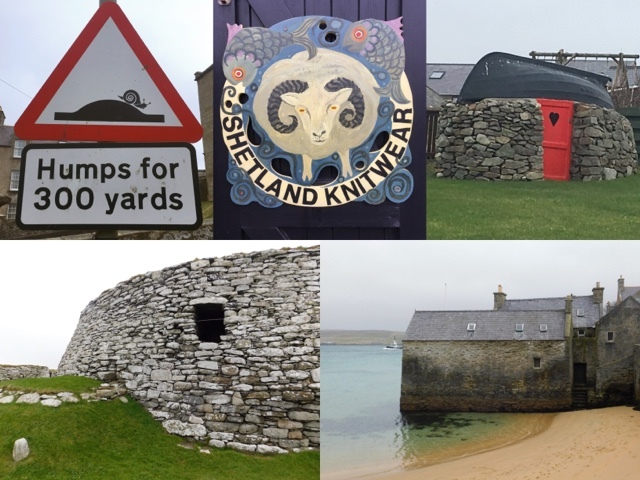 We all thoroughly enjoyed our Edible Shetland Adventure and you can read about part two in my follow up post Unst, South Mainland and Northmavine. Disclosure: We sailed and stayed as guests of Northlink Ferries and Self Catering Shetland. As always, all views expressed are my own. You do get to go to some fab places. I've heard so much about Shetland from Elizabeth that I'm really keen to go. Your tales make me want to go even more. Elizabeth was the perfect tour guide. We had such a fantastic adventure. One day I'll get there! You will - and you'll love it! Wow, what a jam-packed four days you had. Looks like quite an adventure is to be had up north! We managed to squeeze a lot into our 4 days. Watch the space for the next installment. That sounds like a wonderful trip, lucky you! I've always wanted to visit the Shetlands, even more so now! It was a fantastic adventure. I hope you manage to pay a visit in the not too distant future. I love this kind of holiday and having been to Islay a few times now, need to explore more of Scotland's outlying islands. The ferry service looks excellent, great cabins and lounge and food options and I'm really impressed to read the level of detail in until self catering place you stayed in Lerwick. You've done one better than me ans I've never been to Islay! Stornaway and the Outer Hebrides are next on my hit list. What amazing history to explore! Isn't there just! And we barely scratched the surface. Heeheee I love the idea of your poor daughter being embarrassed by her dad! And how fab that Elizabeth was able to help so much. I look forward to hearing more about it all! I've been sailing with Northlink for 18 years and I've never ventured inside the Magnus Lounge - I'll have to remedy that this weekend, I think! :D It was SO lovely to see you and meet your absolutely wonderful family (your children are little treasures!) and I thoroughly enjoyed writing up that itinerary for you and going on our little (blustery!) coastal walk. You encouraged me to upgrade to Premium with Geocaching now too, so I've got loads more caches in Shetland to find! :) Can't wait to read the rest of your Shetland adventures! Wow, what an amazing trip. You managed to cram so much in.I would love to visit some of the islands, such fascinating places and so much history. Also love the idea of a Walker's backpack-perfect for adventures!